Pattern and Rhythm was the theme for Class #2 of Hand Stitching. 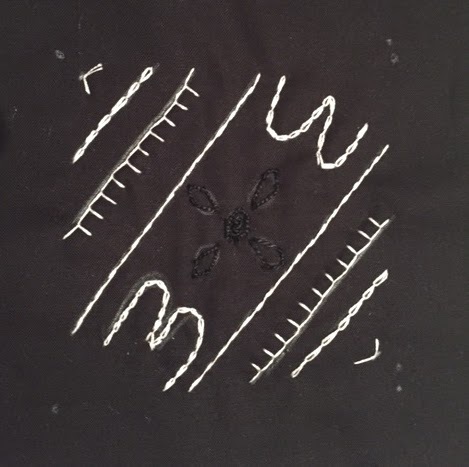 We covered some looped stitches and played with variations. It's amazing how many things you can do with a stitch by distorting it or even changing how thick or thin the thread is. Here are some pieces from the students. I'm beginning to be able to pick out their work...they all have such distinctive voices. Stayed tuned for Class #3: Texture! Love your course format...really seems to be working with you students. Thanks, Roxanne. I'm so happy with how things are turning out. I have a dream group...up for anything! I love seeing how they interpret the Challenges I've put forth. These examples are wonderful. Your students are impressive. Very nice display of works. Thanks, Deb...They're a great group...I look forward to each week. I love all these - as you say so many different styles! If I'm allowed two favourites though, they would be Sarah H's detached chain (I'd forgotten the effects of that one and might just use it in a current project) and Jan B's pattern challenge - lovely variety and deliciously broken pattern. I love it when my students open my eyes to the possibilities! BTW these stitched pieces (the stitched areas) are only 4" square. Theses are wonderful! 4"!!! I love the black/white/neutral threads and fabric. Really brings your attention to the qualities of each line. Hi Susan- That was really my intention. 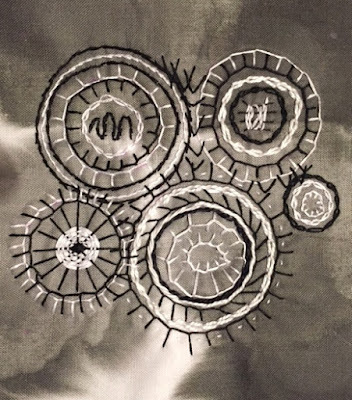 I wanted this class to truly be about the stitches and their potential as marks on the surface.